Beech, hemlock, and spruce logs harvested on Katahdin Forest Management timberlands await loading onto a logging truck. 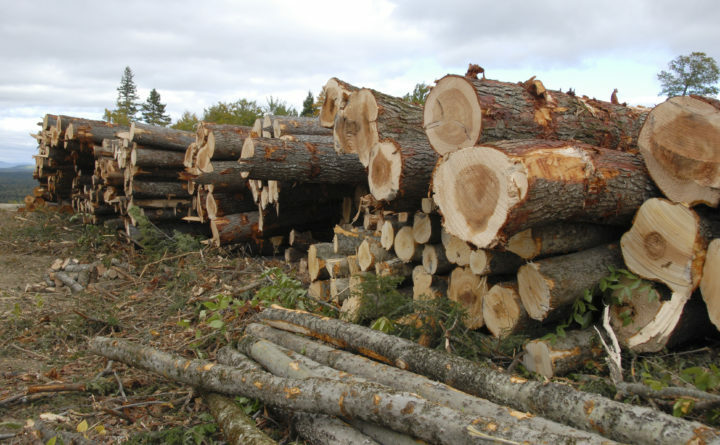 AUGUSTA, Maine — The Maine Legislature’s forestry committee on Tuesday endorsed a probe of the state’s allocation of wood harvested on public lands after Gov. Paul LePage came to angrily deny steering wood away from millowners who oppose his stance on tariffs. The Republican governor addressed the committee Tuesday in response to a list of questions from the panel after a February episode in which the Department of Agriculture, Conservation and Forestry delivered less wood than expected to Pleasant River Lumber, which operates four Maine sawmills. The larger issue is federal. LePage opposes President Donald Trump’s new tariffs on Canadian softwood. Jason and Chris Brochu, the brothers who own Pleasant River Lumber, Maine’s only spruce and fir business that doesn’t straddle the U.S.-Canada border, back the tariffs. The Brochus hit LePage in a Bangor Daily News op-ed last year for a “Canada-first” message. Maine State Forester Doug Denico said earlier this month that while the Brochus have gotten state wood this year, some wood was diverted in February to a Stratton mill that was nearly out. The committee voted Tuesday to send the matter to the Legislature’s watchdog committee, though Denico has denied that the move was related to the brothers’ trade stances and LePage amplified that before the Tuesday committee vote. The governor called the committee’s questions “scurrilous” in a letter, saying he would speak to the panel Tuesday. In the hearing, he singled out Sen. Tom Saviello, R-Wilton, a frequent LePage foe on both the forestry and watchdog committees, saying the senator was trying to “destroy” Denico. That exchange typified the contentious back and forth between the angry governor and lawmakers during a hearing that focused as much on the tension between executive and legislative authority as it did over the questions posed by the committee. After the vote, Saviello said regardless of whether there was retaliation, the LePage administration appears to have set “a terrible policy and precedent” in picking “winners and losers” between competing mills. The Government Oversight Committee, which runs the watchdog arm, meets Friday. They would have to vote to approve the request. Earlier this month, they move to investigate Maine’s child welfare system and OPEGA’s director, Beth Ashcroft, has said she’s leaving in August.